This has to be one of the smallest Black Friday shopping trips ever. Last year I purchased 15 movies for under $30 and this year I knew I had to make a stop at Walmart to see what other movies I could score. I did’t want to spend much as I am trying to put more in the bank instead of our the bank. I ended up with four movies: Twilight, New Moon, and Eclipse plus Despicable Me for all under $10. I ended up heading over to F.Y.E to see if I could find the rest of the Twilight series, but I ended up getting Fast 6 for $7. Another collection complete. I headed over to Five Below and saw a cute iPad case for $3, originally $5. Only thing I hate bout the animal cases is that they are really never sized to the iPad. They’re typically too big. Last stop I made was to the mall. H&M didn’t have anything I wanted and I would’ve stopped in Old Navy (50% off entire store), but I would’ve ended up buying more than necessary. 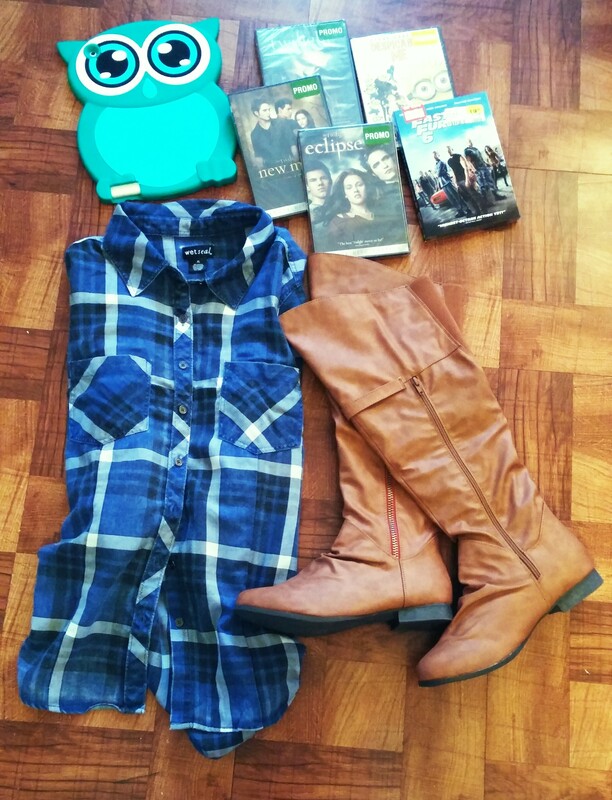 Wet Seal had a Buy 1/Get 1 Free sale and I purchased a pair of boots for $40 and got the plaid shirt free. Expect a future OOTD with those items. I stopped in Charlotte Russe as well which had a buy 1/get 1 for $1 on heels and boots, but of course none would be in my size. They had a better selection that Wet Seal. Anywho, I didn’t break the bank and ended up spending /a little over $50. Not too shabby. Check out my pic below & be sure to follow me on Instagram @MusicMovingForward. HAPPY THANKSGIVING WEEKEND!